It’s a magnet for sea changers and retirees and the locals love to refer to it as ‘Port Paradise’. The truth is there is so much to like about the whole Port Macquarie region. Aside from the fact it is perfectly-placed on the New South Wales mid-north coast – halfway between Sydney and Brisbane. You won’t have to walk too far down the main street of “Port’ before somebody explains it has – allegedly – the best climate in Australia. With its five-star array of pristine beaches, fine dining, delightful rainforests and national parks, delectable wineries, and contemporary galleries, Port Macquarie has come a long way. It’s hard to believe this area, named after Governor Lachlan Macquarie, was established as a convict penal settlement, in 1821. These days the most ‘captivating’ aspect of Port Macquarie is their golf course. And a happy, friendly community-orientated golf club, with a proud history. Port Macquarie Golf Club celebrated their 100-year centenary in 2010, and are powering into their second century, with gusto. Plans are in place for a new gaming balcony and the installation of a TAB in the next few months. There are also changes planned for the golf course within the next 12 months. That will include the alteration and improvement of four holes, along with the construction of a driving range. The club has also recently appointed a new general manager, with the prudent appointment of the popular former Sydneysider Andy Lloyd. This former four-marker has previously played Major Pennants in Sydney, has been a golf club director, was the previous general manager at Bardwell Valley Golf Club and was the ‘house manager’ at the NSW Golf Club, for eight years. While at NSW, Andy was in charge of the most powerful man on earth, for a day, when the former American president Bill Clinton arrived at the La Perouse course for a game. “It was a big operation when Mr Clinton turned up to play the course, I can tell you,” he said. As for his appointment at Port, Andy said the welcome at the seaside club has been, “unbelievable”. In fact the first person Andy had met in the club, on day one, was none other than one of the icons of Australian golf, Rodger Davis. He has since discovered both Rodger’s father and brother, are both members at the Port club. Club competitions are strong at Port, with a men’s competition on Saturdays and Thursdays, ladies on Wednesdays and Fridays, veterans on Tuesdays and mixed competitions on Sundays. Social golfers are welcome, outside member’s competitions. Club membership is currently at full capacity, with a healthy waiting list, however, for those who don’t make it onto the course, or for those who do, The Caddy Shack Café, provides both delicious snacks and hearty dinners for the whole family. Local businesses are great supporters of the club and all club events are proudly sponsored by these businesses. When 27 golfers from Port made a trip south, to Sydney’s Beverley Park, in March 1960, to match their skills with the Sydneysiders, who would have thought, that that inaugural trip, would be the birth of what now must be one of the holy grails of NSW golf. The annual home and away inter-club competition, is legendary between the two clubs, which has produced a multitude of fun times and lifelong friendships between the city and Country Club members. Amazingly Beverley Park have never beaten Port Macquarie, at Port Macquarie. This losing streak has now taken on epic proportions, with comparisons even being made to the 132-year quest to win the America’s Cup. 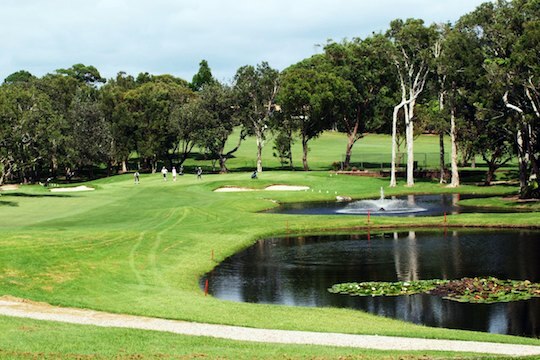 The Port Macquarie Golf Club was formed in 1910, where the course was situated adjacent to the centre of town. By the 1940s the town’s population had grown and it became clear that Port Macquarie had outgrown this original golf course location and combined with the surfacing of several additional problems, including several other parties eyeing off the land, and stricter conditions of use by the local council, it was decided that council would be approached to discuss the possibility of acquiring a site for a new golf course. The man chosen to find a suitable location for a new site, was a dour Scot named James (Jas) Herd Scott, who was one of, “The Carnoustie 300″. That was a 300-strong group of young and eager Scottish professionals and clubmakers, from Carnoustie, who went to the United States and various parts of the British Empire, including Australia, to propagate the game of golf. Although a large number of members were opposed to a move, Scott investigated five possible locations, before settling on the current Tacking Point location. Two separate owners needed a little convincing to sell their parcels of land, therefore, armed with a bottle of O.P. Rum, the committee was able to convince the first owner to sell, followed closely by the second land owner. The club then found itself in dire straits. The new course was five miles out of town, on a road full of potholes and virtually impassable during wet weather, but even worse, the club had no money. Creative fund raising efforts were subsequently undertaken, whilst the pioneering spirit of the locals, shone through as around 40 volunteers, turned up every weekend, in building the first six holes, virtually with their bare hands. By 1954, with continuing financial pressures, the club was forced too, ‘bite the bullet’, in seeking help from the council. So the council subsequently took over ownership of the course, handing the club a long-term lease, which allowed the club to generate future revenues, to complete the further 12 holes, with the co-operation and support of the council. Subsequently, the full complement of 18 holes, were completed in 1967. In 1998 the council again, in a goodwill community spirit gesture, sold the course back to club, whereby the club has powered on ever since. The course today is a par 71, measuring 5884 metres, so although the length of the course is not overbearing, accuracy from the tee is paramount, on the tight fairways. The fairways themselves are excellent, the greens are quite large, and the bunkers have been well crafted. Although the coastline is not visible from the course, the sound of crashing waves, is testament that you are located within metres of the adjacent beach. Within this idyllic golf course location, exists a vast assortment of trees including Norfolk pines, cocos palms, gums, paperbarks, and bamboo. The local wildlife includes kangaroos, koalas, and a very rare white magpie, which was born on the course in 2009, which we spotted on the 17th hole, during our recent visit. The signature hole at Port is probably the picturesque par-three seventh hole, measuring 166 metres. A tropical scenery guards the right side of the hole, while in the foreground exists two dams, one with a water spout feature. The green is long and narrow, slopes back to front, and was redesigned in the early 1970s, not by professional consultants, but a group of the club’s low markers. The other celebrated hole on the course is the par-five ninth, measuring 504 metres. This well-designed, dogleg hole, features clumps of bamboo on the right of the hole, (first planted in 1883), designed to trouble any player who attempts, ” to bite off more than they can chew”, in attempting to reach the green which sits in front of the clubhouse.